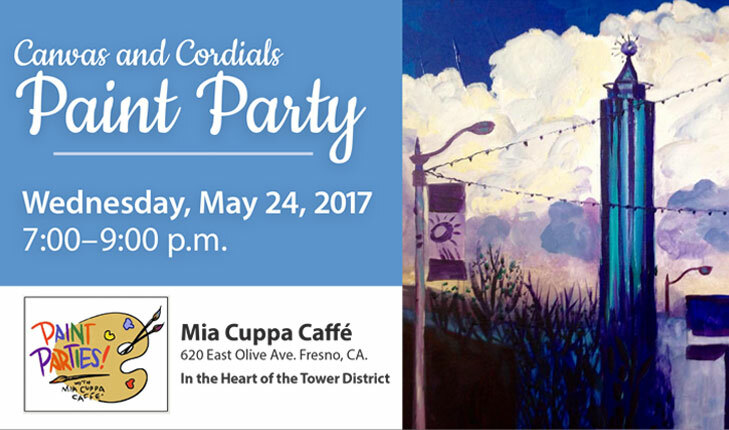 A paint party to support the Arne Nixon Center for the Study of Children’s Literature at Fresno State will be held from 7 to 9 p.m. Wednesday, May 24, at Mia Cuppa Caffé (620 E. Olive Ave.) in Fresno. Guests can arrive early to purchase coffee, tea and food. Funds from the Canvas and Cordials Paint Party, presented by the Arne Nixon Center Advocates, will also support the creation of a community mural in spring 2018 by award-winning children’s illustrator Rafael López. Volunteers will be needed to help prepare and paint the mural wall. Families will be welcome to help paint and add color to a Fresno neighborhood. Housed in Fresno State’s Henry Madden Library, the Arne Nixon Center is one of North America’s leading resources for children’s literature with more than 60,000 books, periodicals, manuscripts and works of art. Mark and Wendy DeRaud will be the painting instructors for the evening. Mark has served as an art professor at Fresno Pacific University and has been a professional artist for over 17 years. Accomplished in oil painting, his wide range of experience includes gallery shows, commercial venues, two massive murals in a large Catholic church and commissions for high-end interior designers and patrons. The night’s painting will be “Stormy Tower,” featuring the Fresno evening skyline with the iconic Tower Theatre spire. The ticket donation price is $45, which covers all teacher fees, supplies to complete a 16–inch by 20-inch painting and a canvas apron to take home. Sign up online at www.anc-canvasandcordials.eventbrite.com or contact the Arne Nixon Center to pay by check. Space is limited. For more information, including assistance with physical accommodations, contact the Arne Nixon Center at 559.278.8116 or email Jami Sanford at jsanford@csufresno.edu.